The updated Third Edition of Developing Occupation-Centered Programs With the Community continues to provide an excellent step-by-step workbook approach to designing and implementing a program for the community. 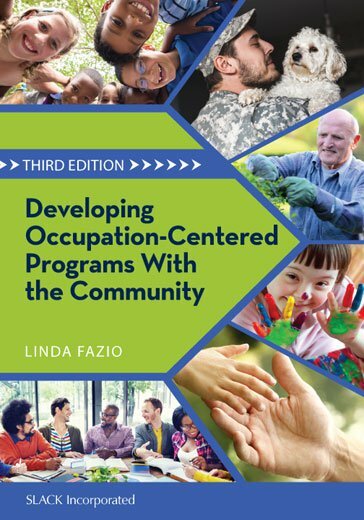 Inside Developing Occupation-Centered Programs With the Community, Third Edition, Dr. Linda Fazio includes the importance of community asset identification and development toward sustainability. New and updated content on evidence-based practice; program evaluation at multiple levels; funding; non-profits and social entrepreneurship. Additionally, new trending issues of interest to programmers include human trafficking, post-combat programming for military veterans and their families, arts-based programming for all ages, and programming to meet current needs of the well-elderly. Workbook format offers the instructor and the student options for how to use the text in a classroom or independently in an internship or residency. The order of the programming process, chapter content order, summaries, and format of exercises has been retained to ease transition for instructors using previous editions of the text. The program “story” section has been retained along with author’s notes on what is currently happening with these programs and other related topic areas. New content has been added in program sustainability, the assessment and building of community assets, and consensus organizing in communities. More developed content is offered about the structure and function of nonprofit organizations, as well as the role and function of the social entrepreneur who does programming for these organizations. Developing Occupation-Centered Programs With the Community, Third Edition is an excellent introductory tool and is a valuable resource for occupational therapy students at all levels, as well as experienced practitioners in a clinical setting. Chapter 3 Program Design and Development: What Skills Will I Need? Linda S. Fazio, PhD, OTR/L, LPC, FAOTA was born and lived her early life on a wheat and dairy farm in Southeast Kansas, where she attended a one-room school as the only student in her grade for 8 years. From there, she went to a small rural high school, and then received a scholarship to Ottawa University, Ottawa, Kansas, to study poetry and art, then to the University of Kansas in Lawrence, Kansas as an art and craft major. Her path then led to occupational therapy. She received her Bachelor’s Degree in Occupational Therapy, Psychology and Sociology in 1964 from Texas Woman’s University in Denton, Texas. Her first employment was with the Veteran’s Administration Medical Center in Northampton, Massachusetts, as a psychiatric staff occupational therapist. It was here that she started her first community-based program with a pottery production workshop for outpatient veterans. Following her marriage to then–psychology doctoral student Anthony Fazio, her work moved to the Boston, Jamaica Plain, Veterans Administration Medical Center. When her husband accepted a faculty position at the University of Wisconsin-Milwaukee, Dr. Fazio began employment at Curative Workshops in Milwaukee as a home rehabilitation therapist. At this time, she began graduate studies toward an MFA in fiber arts and began teaching weaving and fiber art for the Shorewood Opportunity School in Milwaukee. About this time, she realized that her interests were swinging toward historical textile production and she entered graduate studies in anthropology, where she received her MS degree in Anthropology with a specialty in Museology/Textile Conservation in 1977. Her work as an occupational therapist moved to St. Michael’s Hospital, Milwaukee, as a psychiatric therapist, and Coordinator of Volunteers which gave her more flexibility as she raised her two daughters and attended graduate studies. In 1977, she moved back to Texas Woman’s University as an Instructor in Occupational Therapy and began doctoral studies in Counseling, Higher Education/Medical Education, and Administration. She received her Licensed Professional Counselor (LPC) license and began a part-time practice in counseling and occupational therapy with a group of Psychology Associates. She received her PhD from the University of North Texas in Denton in 1985. The following year, she completed Post-Doctoral study in Sexuality and Disability at the Texas Institute of Rehabilitation and Research in Houston; at this time, she was an Associate Professor of Occupational Therapy at Texas Woman’s University and Assistant Dean. In 1987, she came to the University of Southern California in Los Angeles and began to teach and develop a course in community program development that has continued to the present. Her roles at USC have been full-time teaching and administration. She has held the administrative roles of Academic Fieldwork Coordinator, Coordinator of the Professional and Undergraduate Programs, Assistant Chair, Director of Post-Professional and International Students, and, most recently, Associate Chair of Academic and Community Program Support and Development. Dr. Fazio has previously published the first and second editions of Developing Occupation-Centered Programs for the Community and has co-edited two editions of Play in Occupational Therapy With Children with Dr. Diane Parham. She has also authored numerous chapters and articles. She has consulted widely in occupational therapy and occupational therapy assistant program design and curriculum development and has initiated many new academic programs over the course of her career. She has been a continuous member of the American Occupational Therapy Association volunteer sector since 1978, serving as an Accreditation Evaluator, Chair of the Commission on Education, and member of various appointed and elected committees. She has received 43 service awards from the American Occupational Therapy Association.